The World in 2050 (TWI2050) is a global multi-year, multi-partner research initiative launched by IIASA with international partners that involves almost all research programs at the institute. The main focus of the initiative is on deriving viable pathways for achieving all 17 Sustainable Development Goals (SDGs) and to provide fact-based knowledge to support associated policy processes and implementation issues. The initiative achieved several important research milestones in 2017. IIASA, together with the Sustainable Development Solutions Network, the Stockholm Resilience Center, and the Earth Institute at Columbia University, launched the TWI2050 initiative in the wake of the United Nations’ 2030 Agenda that was agreed in New York in 2015. Using an integrated and systemic approach, TWI2050 aims to address the full spectrum of transformational challenges related to achieving all 17 SDGs. The objective is to provide the science and policy advice needed to achieve these goals in an integrated manner to avoid potential conflicts among the 17 goals and reap the benefits of potential synergies for achieving them together. 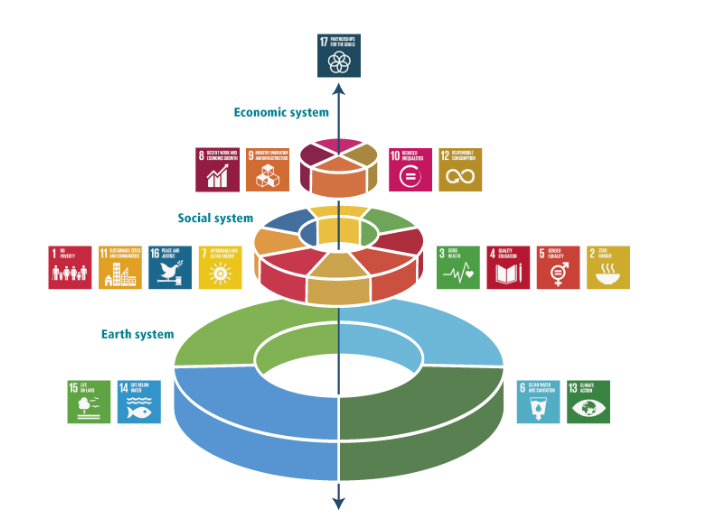 TWI2050 brings together the leading modeling and analytical teams from around the world, including major policy institutions to analyze possible sustainable development pathways for a systems transformation that achieves the SDGs together, while staying within Planetary Boundaries in the long-term. Hierarchical decomposition and grouping of the 17 SDGs explored in TWI2050. Under the leadership of Nebojsa Nakicenovic, IIASA Deputy Director and a researcher with the Transition to New Technologies (TNT) Program who also serves as Executive Director of TWI2050, important progress was made in 2017. The scientific framing of the TWI2050 initiative was completed and a draft paper on defining the SDG target spaces and associated indicators for 2030 and 2050 was completed. Both these papers, along with first drafts of corresponding SDG narratives, were presented and discussed at the third annual TWI2050 meeting, where the working groups also met to deliberate on their work plans around the major themes addressed by the initiative. These activities are currently being integrated into a first TWI2050 report that will be presented to the UN High Level Political Forum in New York in July 2018. TWI2050 results related to technology policy were also presented to the UN Secretary General’s Special Advisory Group on Technology Facilitation where Nakicenovic serves as a member. In addition to the above, the TWI2050 initiative developed a draft funding strategy and was actively involved with the Belmont Forum of Science Funding Agencies to prepare an SDG-related call for research proposals that is anticipated to become a major source of funding for TWI2050-related research globally. Gomez Echeverri L (2018). Climate and development: enhancing impact through stronger linkages in the implementation of the Paris Agreement and the Sustainable Development Goals (SDGs). Philosophical Transactions of the Royal Society A: Mathematical, Physical and Engineering Sciences 376 (2119): e20160444. Gomez Echeverri L (2018). Investing for rapid decarbonization in cities. Current Opinion in Environmental Sustainability 30: 42-51. McCollum DL, Gomez Echeverri L, Busch S, Pachauri S, Parkinson S, Rogelj J, Krey V, Minx JC, et al. (2018). Connecting the sustainable development goals by their energy inter-linkages. Environmental Research Letters 13 (3): 033006. Zimm C, Sperling F, & Busch S (2018). Identifying Sustainability and Knowledge Gaps in Socio-Economic Pathways Vis-à-Vis the Sustainable Development Goals. Economies 6 (2): p. 20. Gomez Echeverri L (2018). A Review of the Nature of Foreign Aid to the Energy Sector over the Last Two Decades. In: Aid Effectiveness for Environmental Sustainability. Eds. Huang, Y. & Pascual, U., pp. 125-184 Singapore: Palgrave Macmillan. Rogner H-H & Leung K-K (2018). The Effectiveness of Foreign Aid for Sustainable Energy and Climate Change Mitigation. In: Aid Effectiveness for Environmental Sustainability. pp. 81-124 Singapore: Palgrave Macmillan. Jackson RB, Canadell JG, Fuss S, Milne J, Nakicenovic N, & Tavoni M (2017). Focus on negative emissions. Environmental Research Letters 12 (11): e110201. Messner D & Nakicenovic N (2017). Transformation zur Nachhaltigkeit ist nötig. Welt Trends 134: 70-71. Nakicenovic N & Zimm C (2017). New technological solutions for the Sustainable Development Goals and beyond. Environmental Scientist 26 (3): 68-73. Peters GP, Andrew RM, Canadell JG, Fuß S, Jackson RB, Korsbakken JI, Le Quéré C, & Nakicenovic N (2017). Key indicators to track current progress and future ambition of the Paris Agreement. Nature Climate Change 7 (2): 118-122. Yu Y, Zhou L, Zhou W, Ren H, Kharrazi A, Ma T, & Zhu B (2017). Decoupling environmental pressure from economic growth on city level: The Case Study of Chongqing in China. Ecological Indicators 75: 27-35. McCollum D, Gomez Echeverri L, Riahi K, & Parkinson S (2017). SDG7: Ensure Access to Affordable, Reliable, Sustainable and Modern Energy for All. In: A guide to SDG interactions: from science to implementation. Eds. Griggs, D.J., Nilsson, M., Stevance, A. & McCollum, D., pp. 127-173 International Council for Science, Paris. Nakicenovic N & Zimm C (2017). Back to the Future: The Role of Quantitative Scenarios and Narratives in Understanding Transformation to Sustainability. In: Future Scenarios of Global Cooperation – Practices and Challenges. Eds. Dahlhaus, N. & Weißkopf, D., pp. 24-34 Duisburg, Germany: Käte Hamburger Kolleg / Centre for Global Cooperation Research. International Council for Science (2017). A Guide to SDG Interactions: from Science to Implementation. International Council for Science, Paris.